Killer Characters: Trying to Plan a Wedding Here! Trying to Plan a Wedding Here! Good grief! Do I have to do everything myself? 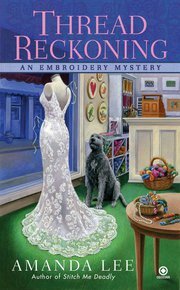 I ask this hard-up embroidery store girl--Marcy Singer--to do some work on my mother's vintage wedding gown, and she asks, "Sure, but would you mind to take care of sending this blog posting for me? It needs to be done by Friday, and I'm totally swamped. Just read over it for typos, and then press send." Excuse me?! I get that she's like little Miss Pixie Dust or some crap and that she's got the majority of the people in this one-horse town wrapped around her finger--even my fiance Frederic thinks she's just as sweet as chocolate fudge. Well, she'll regret asking me to read and send her stupid blog post. Won't she be surprised when she sees my version? And am I the only one bothered by the fact that she has a dog running loose in her shop? The first time I walked into the place, I thought the beast was going to attack me. And if you haven't seen him, he's a huge dog, thank you very much. Marcy swears he's "a good boy"--say that in the most saccharine voice you can muster...and then try not to throw up--but I'm not taking any chances. I had her put the mutt in the bathroom while I was there. And I had her take a lint brush to the furniture before I'd even get my mother's gown out of the plastic garment bag. And then, the mongrel barked and whined the entire time I was there so that I could barely hear myself think much less talk. So, anyway, despite the unnerving racket, I tell Marcy about some jewels my mother-in-law has given me--well, us, really--to go on my dress. The MIL-to-be made a big production about not having much but wanting her son's bride to be married in a beautiful, bejeweled gown. Yadda, yadda. I'm thinking this is the only present we'll be getting from her. Plus, Frederic has hinted about her coming to live with us after the wedding. Oh, joy.... One problem at a time, though--I keep telling myself. One problem at a time. I just need to get Marcy to get on the stick and make me the most gorgeous wedding gown possible before Valentine's Day. Right now, all she can do is whine about my giving her less than two weeks to work on it. It's not like she's having to make my entire trousseau! By the way, stay away from that MacKenzies' Mochas. That nasty Sadie coughed into her hand when I was in there the other day, and I swear she said, "Bridezilla!" What kind of problems did you encounter when you were planning a monumental event? Were the people you had to deal with your biggest headaches?! Cassandra, I'm sure your wedding gown will be gorgeous. BTW, you should have given Marcy more notice than 2 weeks. Two weeks *is* tight, but I know Marcy will get it done. Have to admit, I'm glad you hijacked her blog--had a good laugh this morning. If that's your gown, I hope you give Marcy a bonus. It's beautiful! Cassandra, as a future MIL going through the pre-wedding needs of my future DIL, I'm trying not to take this too much to heart. But it needs to be said, just back off! Give Marcy -- and your MIL-to-be -- a break. Oh...and, I enjoyed your post. Maybe a look at Elaine Viet's Just Murdered would be a well needed glimpse in the mirror as well as a reading break. Now, now... I kinda understand about the dog in an embroidery shop, but do try to be a little more understanding, dearie, about the gown and the tight deadline. Just sayin'... a little compassion would go a long way. I don't understand all these dog crazy people. Don't they know that dogs shed? A dog has no business in a dress-making salon. Besides, doesn't she know that some people are allergic to dogs? You did the right thing to have her clean before you removed your mother's dress from the bag. Don't let anyone intimidate you, Cassandra. You clearly know the proper way to do things. I don't understand why more people aren't as smart as we are. Oh! I love that gorgeous gown! How i wish I will become a bride soon.